Things have been busy here at Chez Belm. I’ve spent a lot of time putting my house in order (literally) and dealing with the freshly-minted moody teenager who has suddenly replaced He Who Will Not Be Ignored. I also realized I was suffering from charcuterie burnout, but I have new projects in the works. As part of the house-ordering I took an inventory of the Deep Storage Facility, which turned up the gouda I made back in September. It had been sitting in my cheese incubator for almost eight months, so it was time to see how it turned out. 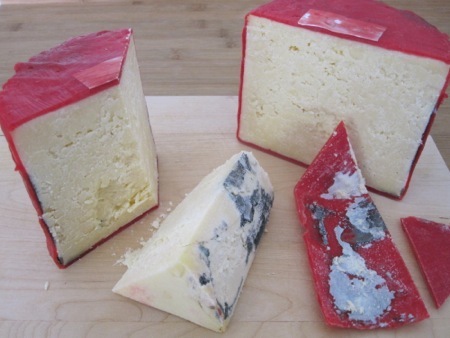 I was certain that the entire cheese had become riddled with mold, and not in a good Roquefort-y way. I resigned myself to cutting it open, recording the level of contamination, and tossing eight months of work and waiting into the bin. 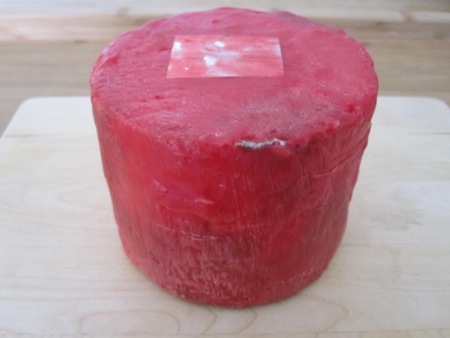 Much to my pleasant surprise – but not yours, since I tipped my hand with the opening photo – The cheese was free of mold except for a few patches directly beneath the wax. It had a deep yellow color and a crumbly texture. More importantly, it tasted like an aged Gouda, which I found encouraging. I should have been making a cheese a month, alternating between Cheddar and Gouda, but now that I’m confident in my handling and production methods I’ll start a regular schedule. I think I’ve figured out a way to manage the temperature control with my sous vide rig, which should provide better consistency between batches. That’s one of the next projects, so stay tuned. This entry was posted in food & cooking and tagged cheese, cooking, food. Bookmark the permalink.